The Church of St Peter & St Paul, Ospringe, stands on the western side of Water Lane, about a hundred metres (yards) south of Vicarage Lane (seen here in 2007). Early churches were often built near springs, which were often sacred, and the one at 'o-springe' was no different. The probable Saxon wooden church was rebuilt soon after the Norman Conquest, and about 1215 it was given a tower and spire. This was circular, perhaps the only one of its kind in Kent. The tower collapsed in 1695 and a new, square one was built. This flimsy example was demolished in 1751 and a bell cote added. The present tower was added in the 1860s. A detached Lady Chapel was built at the bend in the lane around 1425. Its remains were still visible in the 1750s. The bulk of the Ospringe Maison Dieu Monastery was in Faversham. 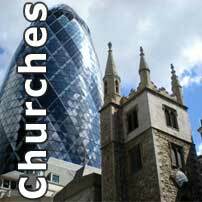 It had two single-cell chapels, one above the other, but only two chantry priests' houses opposite the main complex survive. 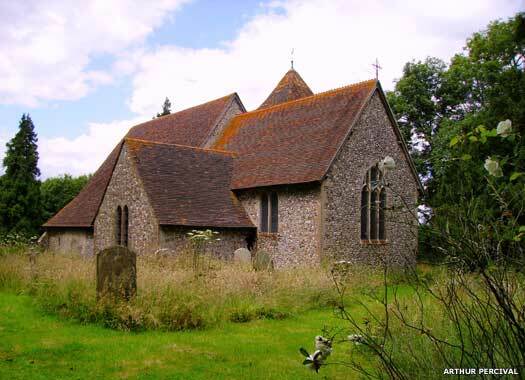 The Church of St Leonard, Baddlesmere, sits on the southern side of the hook in Dayton Road, approximately 140 metres (yards) east of the junction with the Ashford Road. 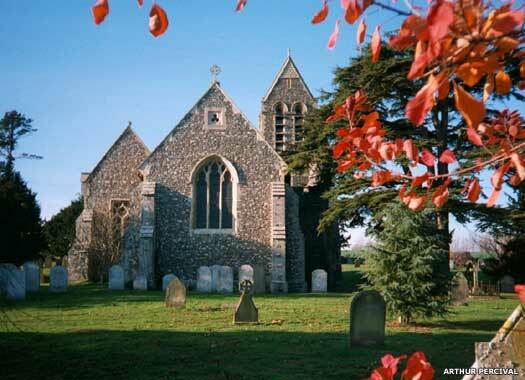 The first church here was built before 1085, and was noted in the Domesday Book. The present building (seen in this photo of 1999, taken from the neighbouring Baddlesmere Court), dates to the thirteenth century and was built in the Early English style. The south chancel chapel was in ruins by about 1650. A sketch from about 1800 shows the former bell cote before it was built up to a small tower with louvres, containing a single bell which came from St Mary Reculver in 1830. Restored by the Whitechapel Bell Foundry, the bell was rehung on 20 July 1987. It has a cement rendering on the outside that is typical of the early nineteenth century and which is preserved today. 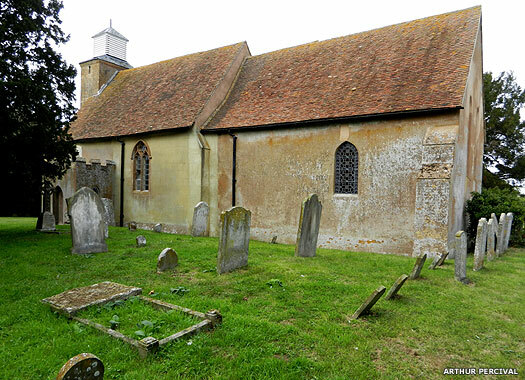 Inside is a totally unspoilt 'Jane Austen' church, unaltered, with box pews, three-decker pulpit, and more. The Church of St Mary, Stalisfield, is situated on the eastern side of Church Road, immediately south of the junction with Hillside Road. The Domesday Book noted the village as 'Stanefelle', ie 'Stonefield', a name well adapted to the stony soil here. 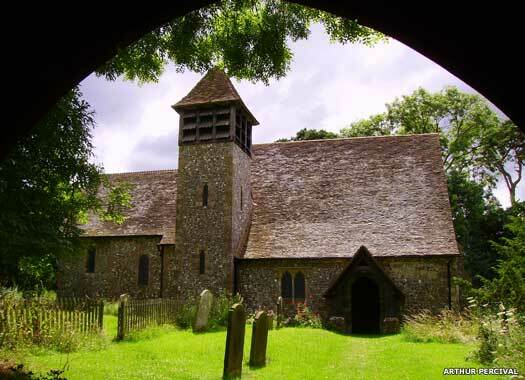 The church is typically Norman, built in the twelfth or thirteenth century. It belonged to the priory of St Gregory in Canterbury until the Dissolution, perhaps part of its original endowment by Archbishop Lanfranc (1070-1093). The cruciform church, with its steeple standing in the middle of the south side, was built using local flint, which is in plentiful supply here. It stands beside the site of the former manor house. 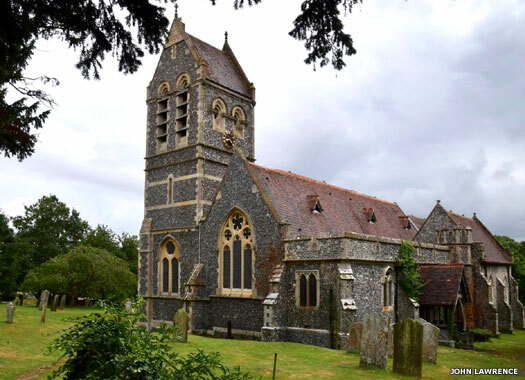 As so often in Kent, the village nucleus is about a kilometre (two-thirds of a mile) away, making the spacious church quite remote on its North Downs hideaway. 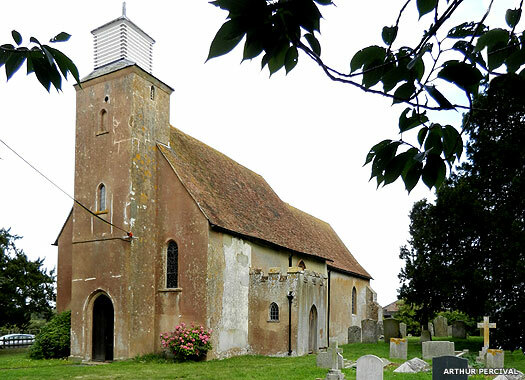 St Peter's Oare was once a chapel of ease for St Mary's, and was detached at some point before the eighteenth century. All photos on this page contributed by Arthur Percival.